WASHINGTON (CNS) — During oral arguments March 23 at the Supreme Court, attorneys on both sides of the Affordable Care Act’s contraceptive requirement examined how the mandate either violates or strikes a balance with religious freedom. Lawyers representing the seven groups of plaintiffs said the federal government’s so-called accommodation for religious employers to arrange for a third party to provide contraceptive coverage in health plans was inconsistent because the government already had been able to provide churches an exemption from the requirement. Paul Clement of the Washington-based Bancroft firm, who was one of two lawyers representing the plaintiffs, argued that religious freedom was at stake in the federal government’s accommodation because even though the contraceptive coverage would be supplied by a third party, the religious employers would still be complicit in providing something that goes against their beliefs. “The problem is we have to fill out a form, and the consequence of us filling out that form is we will be treated very differently from those other religious employers” that are exempt, he said. U.S. Solicitor General Donald Beaton Verrilli Jr., in defending the federal government, argued that the government’s accommodation struck the necessary balance required by the Religious Freedom Restoration Act of 1993. RFRA says that if a law restricts the free exercise of religion guaranteed by the Constitution, there must be a compelling government interest to do so and it must not place an unreasonable burden on the religious exercise. Justice Ruth Bader Ginsburg stressed that “no one doubts for a moment the sincerity” of the religious employers that object to providing contraceptive health care coverage, but she and other justices indicated that such a belief goes up against the compelling interest of the government’s plan to provide health coverage for women, and the accommodation sought to find that balance. Clement argued that an accommodation isn’t “immune from RFRA analysis” and that the problem is giving an accommodation to some religious groups, but not all. Noel Francisco of Jones Day, arguing on behalf of the dioceses who are plaintiffs, also noted that if the government is willing to address the contraceptive coverage in some ways for groups that meet the accommodation standard, than they should look to other ways for other religious groups to be exempt as well. There was a fair amount of back and forth on where the government should draw the line and if it draws it one place, should it draw it again, or should it never have drawn the line in the first place? Verrilli said the government’s line has not always been perfect, but it did try to try to strike a balance. There is an objective limit to what RFRA can do, he added. He also said the government’s solution was the least restrictive approach, and he also did not think the plaintiffs, by using third parties, were complicit in what they disagreed with, even though they have stated again and again they feel that way. As the discussion centered on health exchanges, grandfathered clauses and exemptions, Chief Justice John Roberts summed up the argument with Verrilli as the government’s desire for a “seamless” health care package versus the religious objections of the plaintiffs. 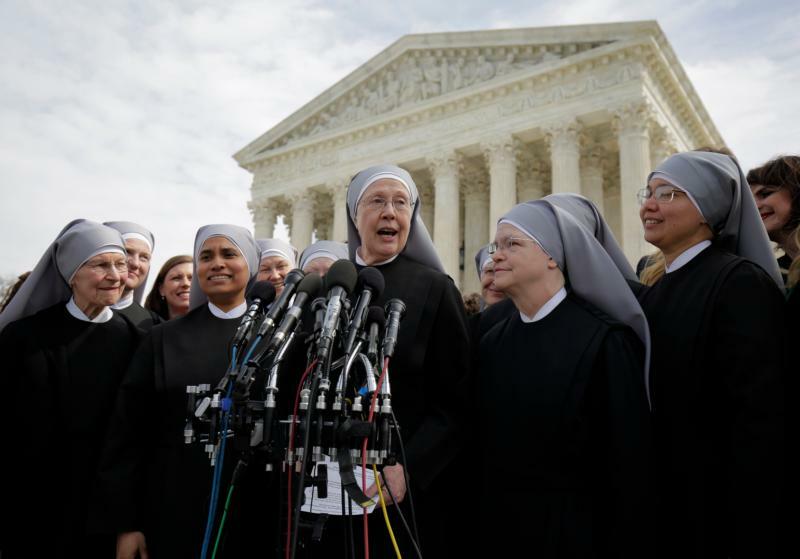 The Little Sisters of the Poor, Priests for Life and the dioceses of Pittsburgh and Erie, Pennsylvania, and the Archdiocese of Washington are among numerous plaintiffs around the country consolidated into Zubik v. Burwell. The case is named for Pittsburgh Bishop David A. Zubik and Sylvia Mathews Burwell, the current secretary of the Department of Health and Human Services. Under the Affordable Care Act of 2010, most religious and other employers are required to cover contraceptives, sterilization and abortifacients through employer-provided health insurance. Refusal to comply subjects nonexempt employers to heavy fines. A very narrow exemption for churches and religious orders was permitted from the start, but several Catholic and other religious institutions and ministries that were not exempted — such as colleges, hospitals and charitable providers — said they could not participate in providing contraceptives without violating their beliefs. The Obama administration then created its accommodation, or “work-around,” that allows objecting employers to acknowledge their opposition to the contraceptive coverage by notifying HHS in a letter. This triggers an arrangement for a third party to provide the coverage. These employers still found the “opt-out” provision objectionable. Five years later, several circuit courts of appeal ruled that religious entities, such as the Denver-based Little Sisters of the Poor, were not substantially burdened by the opt-out procedures. Only one such court, the 8th U.S. Circuit Court of Appeals, in a September ruling, accepted the nonprofits’ argument that complying with the opt-out provision violates their religious beliefs. In the 2014 Hobby Lobby case, the Supreme Court relied on RFRA to rule in favor of two family-owned private businesses, Hobby Lobby Stores and Conestoga Wood Specialties, who argued that providing contraceptives in health care coverage to employees was contrary to the owners’ Christian beliefs. OBAMACARE FAILS THE JEFFERSON TEST FOR RELIGIOUS LIBERTY: Religious liberty has always been a hot button issue. Way back in the 1600s, you could be killed for your beliefs. That’s what happened to Mary Dyer in 1660. When Mary refused to stop speaking about her Quaker beliefs, the authorities in Boston decided she had to die. So on June 1, 1660, they hung her on the public square. Today, Mary is honored as a Quaker martyr and a statue of her sits directly in front of the Massachusetts Statehouse in Boston as well as the Friends School in Philadelphia. According to Jefferson, every citizen should be free to believe what he wants to believe as long as it does no one else physical or financial harm. Do the Little Sisters of the Poor suffer physically or financially because of Obamacare? The clear answer is yes. The Little Sisters are being forced to financially support the sale of birth control which violates their religious beliefs. If they refuse to do so, they will face millions of dollars in fines. What made Jefferson bristle in his day is happening again in our own. If I had ever attempted to pick a nun’s pocket in my sixteen years of Catholic education, I would have gotten my hand slapped. As Obamacare fails the Jefferson test of religious liberty, I do hope the Supreme Court gives Mr. Obama’s hand a good whack.